Ashland has a well-deserved reputation as a great spot to mountain bike. The trails in the Ashland Watershed and on USFS land can be accessed right from town. Ashland and the entire Rogue Valley tends to fly under the radar when the discussion turns to skinny tire riding. I really enjoy long bike rides. On or off road; flat, rolling or climbing heavy- I like them all. One of my favorite routes covers most corners of the beautiful Rogue Valley. If took me a few riding seasons and some insight from co-workers to piece this route together. Starting in Ashland the route will take you through orchards and vineyards as well as some of the cool historic towns in Southern Oregon. There are plenty of spots to stop to enjoy a mid-ride coffee, top off your bottles, or meander through the streets to check out some local shops. You might get a few funny looks if you're rocking the lycra, but the views and fresh air are often worth it! If you come to one of our classes, you can pick the instructors' brains for where you might be able to ride for shorter, longer, dirt, or a higher elevation route. Jeff Menown returns - and is heading to Interbike! Jeff Menown started with us in Ashland after years of industry-level experience in product develpoment, and then moved to Portland when he and Steve were charged with running the new campus in 2009. Here at UBI, we’ve been teaching folks how to build bicycle frames for decades. It’s one of the coolest things any cyclist could ever do for themselves, and is also an amazingly challenging, rewarding career path. Every time we teach a frame class, the instructor builds a demonstration frame to allow students to see the next step, and pick up helpful tips and techniques along the way. Periodically, however, even the most seasoned of frame builders can struggle to find inspiration when charged with building 10-12 frames per year with no specific rider in mind – so, often, the teachers will reach out to other staff members for ideas – which that UBI staffer then gets to integrate into their personal quiver. This is the first in a series of articles detailing one such bike – each inspired by one key unusual component for the entire build. Holiday Season Planning, have you started yet? Keeping a balanced inventory is really important as the industry heads into an era where products are delivered directly to your door for no additional cost. At the holidays, we are always looking to make that extra couple dollars. It’s a common theme in the industry to see shops struggle to maintain that connection to customers and keep them walking through the door. More and more shops have moved away from sales to service as the number one profit center for keeping the lights on and the doors open. We've got some reminders of some best practices during the holiday season that we talk about during the last day of our Pro Class. 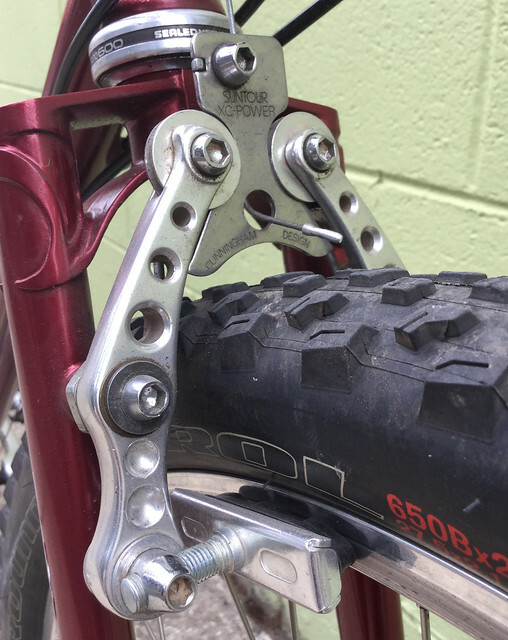 Along with the wave of electronic components, there was a cultural aesthetic riptide which added the difficulty to streamline the outside of the bike: hide the wires. One advantage here is that the electronic signals no longer require straight lines or necessarily smooth curves to achieve the perfect response; although a kink wouldn’t be great either. While Shimano spent many extra hours streamlining ways to add the wires into the bars and stem, the frames also needed to change. Following this same line of thought, is an entirely new way to think about frame construction. The classes we present at UBI are not exempt, in fact, frequently our instructors are already on the front of that thought, querying; how can we bring this to our students? A tool by any other name; Still works just as sweet?